In the UK bat species will roost and find shelter within tree features such as rot holes, fissures, hollows and woodpecker holes. Aerial inspection surveys are a useful technique for identifying and investigating bat risk features found within trees. Such features can be difficult to assess from ground level or by ladder, whilst an aerial assessment provides a definitive and cost effective alternative which can compliment other surveys (e.g. bat activity surveys). Aerial inspection can be particularly useful for ruling out features which may prove to be superficial once under a close inspection. 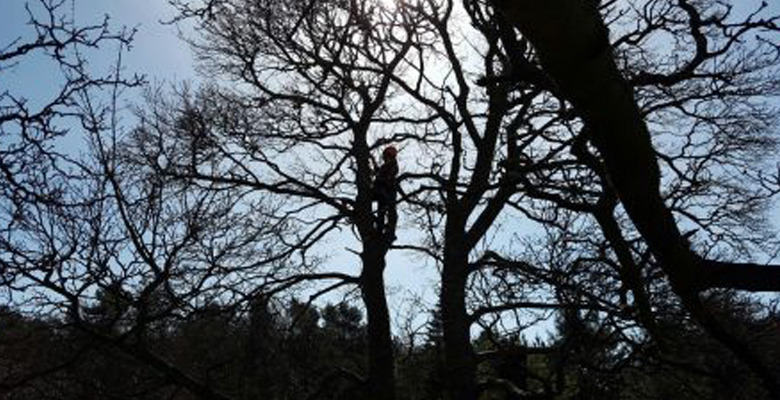 With this in mind, many ecologists are now looking to upskill to offer such services – a week long course in ‘Aerial inspection and rescue’ can equip ecologists with a range of skills borrowed from our arborist friends to undertake inspections within the canopy. Myself and my colleague Paul, both licenced bat handlers, joined the arboriculture department at Houghall College in Durham for a week to get our ‘climbing tickets’ (City & Guilds NPTC CS38). The course was taught by college lecturer and all round tree guru Chris Wheatley, with input and support from the other lecturers throughout the week. With 5 days of tree climbing in beautiful sunshine ahead we were naively optimistic about the week and enjoyed a Monday morning of theory, rope tying and conversation; the perfect lull in to a false sense of security. Both myself and Paul are keen rock climbers, with Paul having ventured into the realms of ice climbing and a spot of tree climbing in the past; how hard could it be? With my knowledge of rope systems and experience of planning routes I felt quietly confident, whilst Paul, EcoNorth’s very own action man, was not remotely phased by the looming beech trees which towered above us on Monday afternoon. Chris, our instructor for the week, demonstrated the technique for the initial climb to the first anchor point within the tree, which demanded a certain amount of accuracy throwing ropes in to the canopy, setting up the rope system using bow lines and prusiks, followed by a thrusting motion used to ascend the lower trunk of the tree. Chris was clearly a dab hand at this, scaling trees in a matter of minutes, however, for us mere mortals, all confidence was lost as the sheer effort to get to the first limb proved exhausting and unnatural. With a bit of egging on from Chris and some considerable time later, we both made it to the top of the canopy, around 25m off the ground, through a number of rope changes and re-setting of anchor points. Once you are at the top of the tree you secure your top ‘anchor point’; this then allows the climber full access to the entirety of the crown, and for us, access to any bat risk features. Day 2 began in the ‘Hospital field’; I questioned the name at the time, but it later proved quite apt. The field contained a mixture of mature oak and sycamore, beautiful mature specimen trees which the college use to practice tree climbing, limb walks and aerial rescues- these trees made Monday’s beech trees look like saplings. Tuesday and Wednesday passed in a blur as we became more and more confident in our technique; Paul proved an expert at limb walking whilst I particularly enjoyed the aerial rescue scenarios rescuing an unconscious 6’3’’ Paul from the canopy. Whilst we both grew in confidence our hands were starting to take the toll of constant climbing and rope work. By Thursday our blisters had blisters and our legs were black and blue from the constant ascent and descent against the gnarled, aged, tree trunks in the Hospital field (more apt now). Thursday’s lesson was the most nerve wracking of all.. pole climbing and rescue using foot spikes and a strop. The challenge here was mostly mental; we each had to ascend the pole with our new found technique (without slipping back down and crucially, without spiking the casualty on the way up! ), attach a rope system, then descend the pole to the casualty and undertake the aerial rescue. Paul’s ice climbing experience came in to its own with Paul confidently undertaking the rescue; I on the other hand found the lack of ropes and likelihood of falling off the pole (and taking Paul with me!) unnerving and took it at a slower pace. Assessment day arrived and we met up with Andy the assessor, who immediately put us at ease; first we had the theory test covering legislation, risk assessments, methodology and rope tying…not a problem; next we began the climb to secure our top anchor point. This can take a lot longer than you may think; on a tall complex tree, it could take up to 45 minutes, maybe longer. Next, we had to choose a suitable limb for a secondary anchor point to allow us to carry out a limb walk; ‘if it’s as thick as your wrist it will take your weight’ – the words of Chris, our instructor, stuck in my mind as I chose my first ‘secondary anchor’. Limb walks are a funny thing; you edge out on thin branch, trembling in thin air whilst leaning back in to your harness; you put all your trust in to your rope system. The assessment requires two limb walks to around 5m from the trunk; once I had completed both I felt the end was in sight- putting the impending pole rescue firmly to the back of my mind. After a quick break and four successful aerial rescues it was time. We headed over to the pole climbing tree; a bare conifer scarred by the spikes of other climbers, you could see where they had slipped and taken long strips off the bark off. Mind over matter; we began. I nervously spiked up to Paul’s feet, changed to my secondary strop, spiked up to Pauls hands, changed back to my initial strop and carefully spiked above his hands to secure the rope system. Tying knots and prusiks in mid-air whilst only secured to the pole by two small metal foot spikes is not for the faint hearted. Relief. I was secured to the rope system and could now lower myself down to the casualty. Locking Paul to my chest harness was the first port of call, this meant if he fell, we were attached and secure. A secondary prusik then allowed me to attach Paul to my rope system; I lowered us both down to the ground with a sigh of relief. It was Paul’s turn next, the ever calm and collected action man – I meanwhile played a convincing damsel in distress as I became the casualty, still unnerved by hanging on to the pole with nothing but my foot spikes. And then it was all over; we descended and the assessor confirmed that we had both passed. To say the course was challenging is an understatement, we were pushed both physically and mentally to the edge of our comfort zones. It was also one the greatest thing I have achieved and a fantastically fun week. It will probably take a week or so for our hands to recover, but we are already looking forward to getting back up in the canopy with our new-found knowledge and confidence…bring on the bats! If you are in need of aerial inspections, please do not hesitate to get in touch with the EcoNorth team.